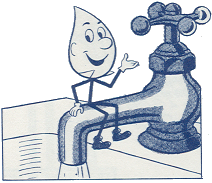 Raleigh Water District started out in 1921 as Raleigh Water Users, a private corporation. The district became public utility as the Raleigh Water District in 1947. The district has three storage tanks: one holding 750,000 gallons, and two holding 500,000 gallons each. In case of an emergency interruption of the district’s water supply lines, the tanks store enough water to provide customers with three days of supply if water conservation is maximized. The elevation of the district’s tallest water tank is 396 feet, making it one of the tallest structures in the area. There is 74,000 linear feet of water line buried underground within the district, ranging from 2 to 12 inches in diameter. There are 65 fire hydrants in the district.